Want a Folding Elliptical? There Aren't A Ton of Choices Out There! We get a lot of inquiries regarding folding ellipticals, as more often than not people have limited space in their workout areas. Sometimes it’s just not enough to have a compact elliptical….you need something that actually folds up after a workout to learn up against a wall or even go inside a closet. Fortunately, you do have some options when it comes to ellipticals that fold, and it’s not just the cheap, small trainers. Some of the full size machines can actually fold as well, making them a great option. If you’re tight on space in your home gym and want something that you can transport to another area after use, definitely consider one of the many folding options out there. Starting off with the largest brand, NordicTrack, you have the Rear Drive Series, which consists of the SpaceSaver SE7i and SpaceSaver SE9i. Both of these elliptical machines can fold with a special hydraulic system that you can operate with just a touch of a button, making folding and unfolding a breeze. Either the SE7i or SE9i is a great choice, and they are a bit more compact than most ellipticals as well. 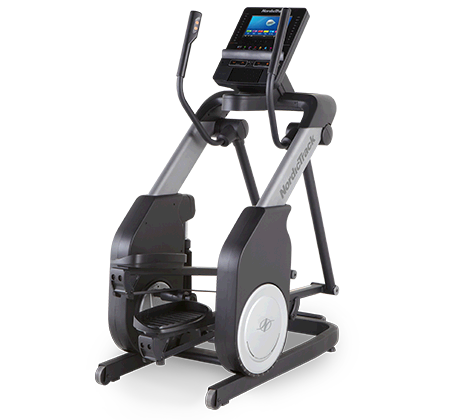 Moving on to ProForm, another leading brand from the same parent company as NordicTrack, you have the Smart Strider ellipticals. This includes the base 495 CSE, mid-level 695 CSE and top of the line 895 CSE. These ellipticals also use the SpaceSaver design system like the NordicTracks, although they have a slightly larger footprint overall. Interestingly, Sole Fitness, another popular brand that competes directly with NordicTrack and ProForm, does not make any folding ellipticals. Moving on you have Horizon Fitness, and they actually have a front drive series that folds, as opposed to the rear drive folding models that NordicTrack and ProForm have. The Evolve 3 and up-level Evolve 5 can easily be folded with the company’s FeatherLight Folding capability. You simply lift up the machine from the bottom and you’ll feel like Superman as the elliptical does all of the work for you. Releasing a lever makes the machine slowly come back down again when you’re ready for your next workout. Interestingly, that’s about it when it comes to folding ellipticals. The majority of the machines on the market do not fold, so if one of these models doesn’t appeal to you your best bet is to just go with a compact machine that won’t take up a lot of space and can stay in place after your workout. Above we’re discussing the regular sized ellipticals, but if you’re talking about the really cheap ones, i.e. under $400, then you may find more of them that fold up. On these low priced models, there are fewer parts, and they are much lighter overall, so it’s much easier to make them foldable. Many of the ellipticals from companies such as Sunny Health & Fitness, Exerpeutic and Stamina, all entry level trainers for the most part, can be folded easily after a workout and placed in a corner or in your closet. What’s the Bottom Line on Folding Ellipticals? Most of the ellipticals from NordicTrack, ProForm, Sole, Horizon and other popular brands, as well as higher end machines from Life Fitness, Matrix, Precor and others, do not fold. The way these ellipticals are designed, if they made them foldable it would compromise the integrity of the machine. It might not be as sturdy, or may not provide the ideal feel or motion. So when it comes to foldable ellipticals, you have one or two models from each of the popular brands, except for Sole, and then you have a few here and there from some of the entry level brands. 1. If you need something that doesn’t take up a lot of space, look at the base model in any elliptical series. Those machines tend to take up the least room, and although they might not fold, they’ll have a smaller footprint overall than some of the more expensive ones in the series. 2. High end ellipticals never fold. If you’re looking at an elliptical over $2000, you can bet that it won’t fold up. So if you need folding capability check out ellipticals in the $1000-$2000 range, or really cheap ones under $400. Those are your folding options. 3. If you do get a folding elliptical, make sure it has ample stride length for you. Many of the foldable models have stride lengths of 18″ or less, which may not be comfortable for you, especially if you are on the taller side. If you need a folding elliptical, don’t despair. There are options out there for you. But remember the options are fairly limited. There are many more folding treadmills than folding ellipticals. Look at the choices from NordicTrack, ProForm and Horizon to see which ones appeal to you, or if you’re in the market for a cheap elliptical, check out Exerpeutic, Sunny Health & Stamina.